HELLO HAPPINESS, HERE I AM …. My name is Kerstin; however, friends call me Körmi (Kermi) and also people that I meet on my travels around the world find it easier to pronounce. I have many interests and I consider myself to primarily be a creator, adventure seeker, soul traveller and surfer. I am currently on an adVANture, discovering personal happiness on the road around Europe with my tiny rolling home, Patscho. Patscho is a bright orange Piaggio Porter Minivan which I converted into a cosy one person living space for my Bachelor thesis in Architecture. In modern society happiness often gets associated with social status and materialistic things however, this for me feels misleading and wrong. But where does happiness come from instead? Where can I find it and even more important keep it ? With this question a new journey and project started in my life. In 2016/17 I set off to South America for a one year studying experience and it was a very big learning curve on different levels. I learnt a lot about poverty and living with less whilst working on architectural projects rebuilding houses and hope after Earthquakes. The poverty I witnessed combined with the lack of luxuries available to me whilst working on projects made me think about what is and isn’t important in my life. There is one major thing that often holds us back from our personal dreams and fulfilling happiness, it´s fear. The fear to not be accepted by society with its standards and norms. Instead of focusing on fear, I starting asking myself direct questions; what do I want to achieve? What makes me happy and how can I maintain the two? At that moment the idea for my thesis was born and started rolling when I flew back to Germany and found Tollpatscho! The orange cutie was the perfect size for my project and would enable me to demonstrate the current movement of mobile living in small spaces.The modern nomad with his constantly changing work and living places needs flexibility and grounding at the same time. Mobile living solutions enable the Generation restless to be at home anywhere. This satisfies a deep yearning for a base and a home on the go. Which I personally missed during my time in Southamerica and I now wanted to create for future travels. Whether as a second home, for travel or as a permanent way of life, mobile living is an important part of today’s society and offers numerous advantages. In combination with a minimalistic lifestyle it gives inspiration for future social and living developments. On our overused planet with housing shortage in many parts of the world we got to use less resources in order to ensure the survival of upcoming generations. I feel that societies have become and will become even more accepting and supportive of contemporary lifestyles for example, the Tiny House Movement which has become increasingly popular throughout America and Europe in recent years. Tollpatscho is merely 3sqm in size however, he has numerous functions, like a Swiss army knife! Depending on the opening and folding status of the minivan, different rooms are created. Various compartments and living areas can be created by pulling, pushing and folding, for example, a sleeping box becomes a cosy living room with couch and table. Having experimented with and put the vehicle through its paces already on my journey, I can say with confidence that the all-round construction of the van both internally and externally is exceeding expectations and getting is recognised as more than just a mini campervan. My time in the van so far has been a great experience and the ease of driving a compact yet sufficient vehicle allows me to set up camp wherever suits. More importantly, the maintenance and fuel are low and because the van isn’t as fast as other vehicles on the road it gives me the opportunity to admire my new surroundings with more time. I spend a lot of time outside of the van, even when it is raining you will find me cooking outside. This might not sound ideal to most but it’s great to make the most of the functions that the van has to offer. Tollpatscho forces me to live within nature. Which is another reason I am happy I made the decision to start this adventure. There is nothing more beautiful than waking up in the most isolated and beautiful spots surrounded by pure nature, having a look out of the window and seeing perfectly lined waves running into the shore. As for me, happiness comes in salty waters and waves. My passion for surf is like my travel guide. I stay close to the ocean and travel with the swell and wind along the European Coastline. It somehow gives me an anchor and security in my nomad lifestyle. 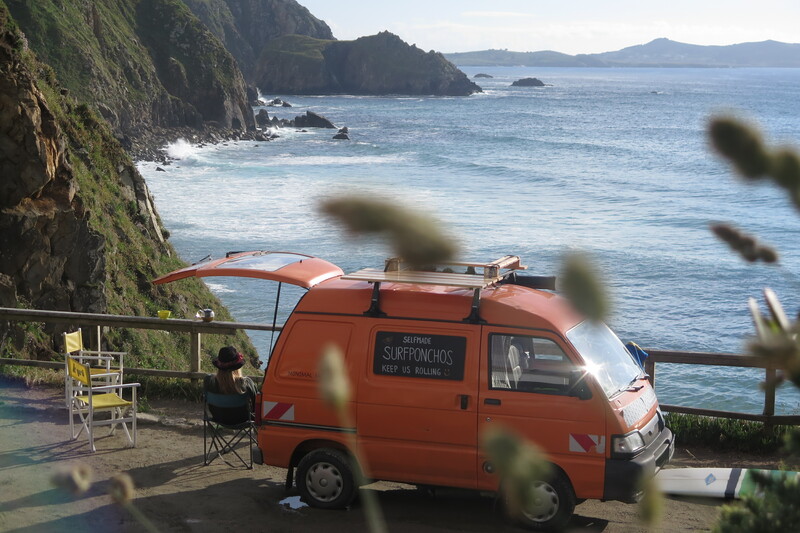 As well as surfing I am able to enjoy my other hobbies from the van such as writing, making jewellery, socialising and exploring new cultures. At the moment I am in Northern Spain looking out of the window writing this and waiting for the wind to stop so I can go for another surf this evening. Over the next few months I am hoping to travel to Brittany, Cornwall, Scotland and Ireland. Let’s see how long my little rolling shop and KörmiKörmet keeps us going! Körmi Körmet is the name of my label which is an expression of the things I love to do. Its slogan is ‘Happiness is Homemade’ and this stands for my life philosophy and handmade products. I created my label a few years ago and worked on it alongside my studies. I have always enjoyed being creative and being able to make things with my own hands. Körmi Körmet gives me the chance to keep on rolling whilst improving my skills and earning a small income. I mainly produce jewellery, travel accessories and surf-ponchos. I enjoy doing this on the road as it gives me an opportunity to share my experiences, pursue my passions, as well as, inspire and encourage others with my tiny home. When I first started traveling I made a schedule for friends to join me on the trip and filled my time to ensure I was not alone. Many old friends are joining me on my trip and I love to make memories with them, as well as, meet new travel buddies. However, I have learned not to fear the absence of it and to even enjoy my own company at times. It is like with everything in life, if you know how the opposite feels, you learn to appreciate things differently for example, a sunny day after a week of rain. Over the past couple of years, I’ve started thinking about what ‘home’ means to me. Home holds a different meaning for everyone for example, a house, a place, family or friends however, during my travels I noticed that there is one other very important thing that can mean home and we can find it within ourselves. Its the only thing we are always surrounded and we will never miss. Gandhi once said; “Happiness is when, what you think, what you say and what you do are in harmony”. This quote means a lot to me as I believe that once you truly accept who you are and what you want to be you will achieve fulfilment. Happiness will not come to you, it can only come from you! I’ve come to realise that if you feel comfortable with and by yourself you will always feel at home anywhere you travel as you have a sense of belonging. This realisation is probably the most powerful and satisfying discovery of my journey so far. Having spent so much time away from my usual surroundings, I was able to focus on myself and grow as a person, that’s why my trip has been more than a journey around Europe but one on the inside as well as: „Happiness is not a destination but a journey“. To conclude, I have decided to stop searching for happiness but started to create it myself. and home can be wherever I am.